Elizabeth Kolmstetter and Nick Skytland presented on the future of NASA in terms of both its operations and culture as a work environment at Common Hour. Common Hour this past Thursday featured two representatives from NASA who talked about its future directions both as an agency and as a workplace. 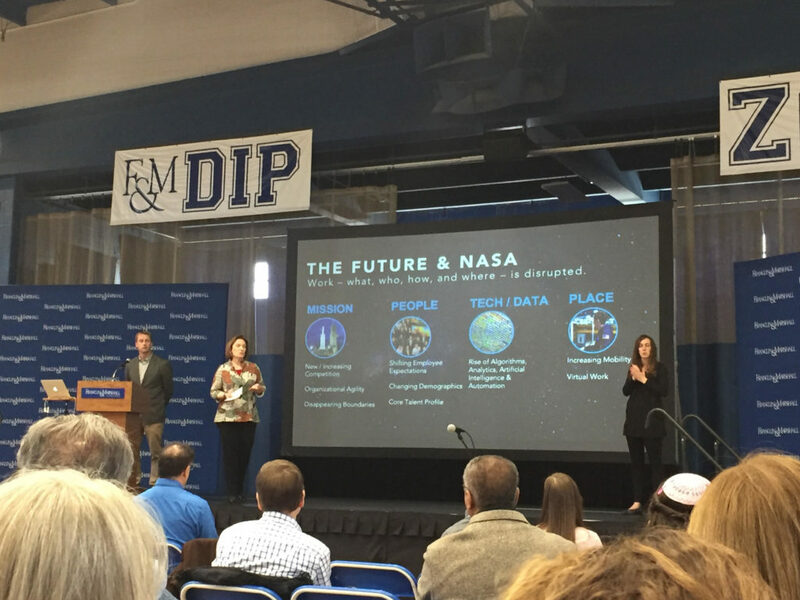 Nicole Kolmstetter ‘21 introduced her mother, Elizabeth Kolmstetter, Ph.D. Director of Talent Strategy and Engagement, Office of Human Capital Management, NASA, Washington DC and Nick Skytland, Talent and Technology Strategist, NASA, Johnson Space Flight Center, Houston, Texas. Kolmstetter remarked on the timing of their presentation, as two days before, U.S. Vice President Mike Pence, as chair of the National Space Council, had challenged NASA to put American astronauts on the moon again in the next 5 years. She talked about the need for NASA to transform how it operates, while sticking to its mission statement, which involves enhancing humankind’s knowledge, education, and innovation. Kolmstetter emphasized that it is the people that accomplish this mission, which necessitates a strong work environment. NASA has now been named the best place to work within the federal government seven years in a row. There have been four eras of exploration within NASA’s 60 years of operation that Skytland described. The first era, starting with NASA’s founding in 1958, was characterised by a competition with the Russians and an urgency that they have not felt in a long time. This era also involved a vast amount of new technology that no one had ever seen before. The second era is marked by the first men landing on the moon. The creation of the skylab and the possibility to continue to explore distinguished the third era. The space shuttle program and the international space station marked the fourth era of exploration. Skytland noted that Pence’s 5 year timeline is an “aggressive time frame,” yet possible. In three years, NASA will fly around the moon once again to demonstrate their ability to do so before landing astronauts there two years later. Kolmstetter and Skytland shared takeaways from their Future Work Study, which looks at enhancing both the work at NASA as well as the employee experience. They acknowledged that there are many other private industries exploring space that they are partnering with, like SpaceX and Blue Origins. Looking at key categories including mission, people, technology/data, and place, they developed a framework to see the intersections of these categories. For example, looking at the intersection of technology and place, they can think of ways to use technology to include talent at NASA from all over the world through virtual means. In addition, Kolmstetter discussed the different characteristics NASA looks for in potential employees, such as curiosity, agility, ability to work within a team, and passion for exploration. She emphasized these as “foundational to our culture of innovation.” Innovation is essential to NASA’s mission in any position within the agency, whether one is an engineer or an HR worker. At NASA, they avoid becoming too risk averse, as such an organization must take risks to grow and adapt. In fact, they celebrate failures over successes as opportunities to learn. When applying to work for NASA, one must recognize the importance of failure.